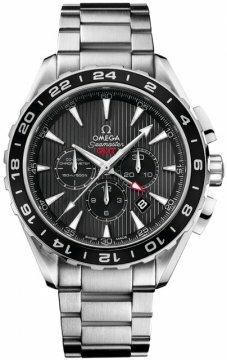 Buy this new Omega Aqua Terra Chronograph GMT 231.10.44.52.06.001 mens watch for the discount price of £4,964.00. UK Retailer. Brushed/satin finished stainless steel case with polished beveled edges. Brushed/satin finished steel bracelet with polished finished edges. Lacquered grey dial with linear textured design & solid black sub-dials. Applied polished steel hour markers & polished steel hands. Hours, minutes, chronograph seconds hands & index hour markers with luminescent fill. Dark Grey PVD coated stainless steel bezel with 24 hour graded markings. Red arrow-head hand points to desired GMT timezone. This hands makes one rotation in 24 hours. The addition time is indicated in a 24 hour mode to eliminate confusion between am/pm at the desired time-zone. 30 minute counter sub-dial at the 3 o'clock position. 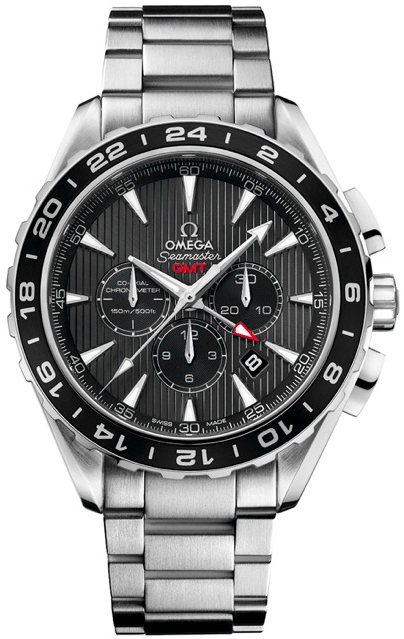 Omega COSC Certified caliber 3603, beats at 28,800, contains 37 jewels & has an impressive power reserve of approximately 55 hours. Last but not least this movement integrates the now standard Co-Axial Escapement which contributes to greater precision, stability and durability & reduces the necessity of lubrication thus reducing the time required between servicing.